The day my father died my mother did not shed a tear. Aunt Joan guided me, and my little brother Mike, away from the house full of mourners to the backyard where my father had introduced me to Classical Greek mythology and the wonder of stories well told. Joan understood the crushing weight of that moment on a ten year old with every reason to idolize his father. She loved him dearly, too. Days before, in an ominous request, he had asked me to look after Mike and our mother. Thanksgiving, once filled with laughter and family pranks, would never be the same. The night before I would chop vegetables, help prepare the stuffing and pies. In the morning when the cooking began in earnest we cleared the galley-style kitchen as mother worked her magic with a singular focus and elbows flying. I was trusted to carve the turkey. As many as twenty people, they were mostly smokers so they are mostly dead now. After the glorious meal everyone praised my mother then the men wandered off to the den to eat pumpkin pie, smoke cigarettes and pass out watching football. In the kitchen my mother smiled reassuringly and shared a salty joke or two about the pitfalls of relationships. I’d help with the dishes then Joan and I would retreat to a quiet corner to discuss the mysteries of life. In the turbulent years that followed, through the Age of Aquarius, riots and the sexual revolution, Joan gifted me treasured books on poetry, yoga and Zen meditation. She introduced me to the writing of Alan Watts, P.D. Ouspensky and Joseph Campbell. The Power of Myth illustrated the bond between my father, Joan and me, how the mythology of every culture shapes our world and shades our understanding. The divine nature of the sacred feminine is the refuge we all seek once we tire of slaying dragons, when our inner battle has been won. 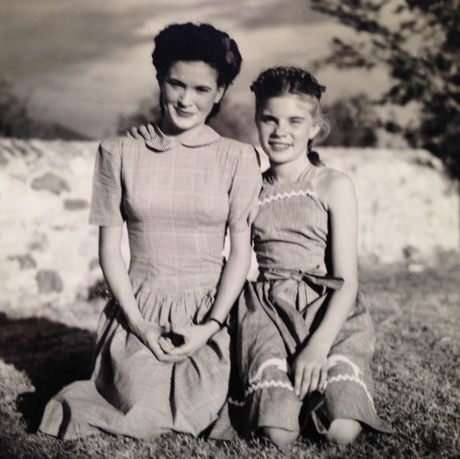 On this long Thanksgiving weekend, I acknowledge my mother and her younger sister – my spiritual mother – and all the people I have known and loved because of their strength, encouragement and example. Photographs and memories will ultimately fade, but while I draw breath I am thankful for my two mothers and every teacher, friend and prankster I am blessed to know.